@BESW I bumped up my patronage in response, just to stick it to 'em. I know that it in no way sticks anything to anyone, but it still felt better. A lot of patrons seem to be withdrawing from Patreon entirely and giving the same amount or more to their favored creators through PayPal, while watching Drip closely for further developments. Evil Hat made up a whole new tier for patrons which lets them pledge the same amount as before in actuality. All seem like reasonable responses. Many creators are screaming bloody murder and swearing to jump ship to any alternative service that shows up which doesn't obviously slaughter kittens. Aside from the timing, what're the substantive complaints? Is it Patreon that's nixing the bundling, or was that processors? Patreon's nixing bundling at the same time as increasing flat fees to patrons for each charge, and presenting it to the creators as a way to increase the money which goes to the creator when it actually doesn't for pledges at the lower (and thus more populous) end of the pledge spectrum... and when asked for clarification they said that they don't want casual creators anyway, they want to cater to big-name creators. Nobody can figure out why they're dropping bundled charges anyway; if they'd just been increasing the flat fees it would've been a despicable but understandable cash grab, but by unbundling the charges they're not actually making any money off the change. ....Also their presentation of the whole thing is awful. Just a better PR job might've made the situation a good bit less apocalyptic for them and their creators. @BESW Ugh. That last bit is unconscionable. They've got the architecture set up, what trouble is it to be accessible to the little people? @BESW Yeah, the bundling just seems to be a hit to the banks, not to creators nor patrons nor patreon itself?! I've seen some analysis about shareholder influences. I don't understand it entirely, but it's something to do with being ridiculously overvalued even in the context of the app bubble and needing to do something to catch their actual value up to their speculative value. Everything's moving so fast, the last analysis I read came before the clarification that they're unbundling. I got a recurve bow from office Secret Santa. @BESW Yeah, I've heard a rumor that this is a result of VC funding from Paypal. If Kickstarter's Drip service can speed up their timetable, they can eat Patreon for lunch. @nitsua60 I imagine it's like normal Kickstarter but subscription-based. @Yuuki "Kickstarter: Keep Kickin' It"
Instead of funding $60 at once, you kinda space it out. Like $10 every month for half a year. Yeah, it's Kickstarter's foray into subscription crowdfunding. Drip used to be a musician crowdfunding site, but Kickstarter bought it and has been re-tooling it. Hmm... I can't tell which hand dominance this bow is for. They just announced their plans for the new version last month. Logic tells me that it's most likely a right-handed bow, but the grip feels slightly more comfortable in my left hand. would that just be because you are left handed or? My other assumption was that someone somehow knows my eye dominance despite me not knowing it. But I just tested it and I'm right eye dominant. So that theory went bust too. @UrsulaV I'm working on a comparison list of a bunch of sites this weekend, pros and cons and requirements and logistics. I've seen itch.io, Libera Pay (I already discussed some things for consideration on that one), Paypal, Ko-Fi, Thrinacia, and Snowdrift Wiki's index of sites. 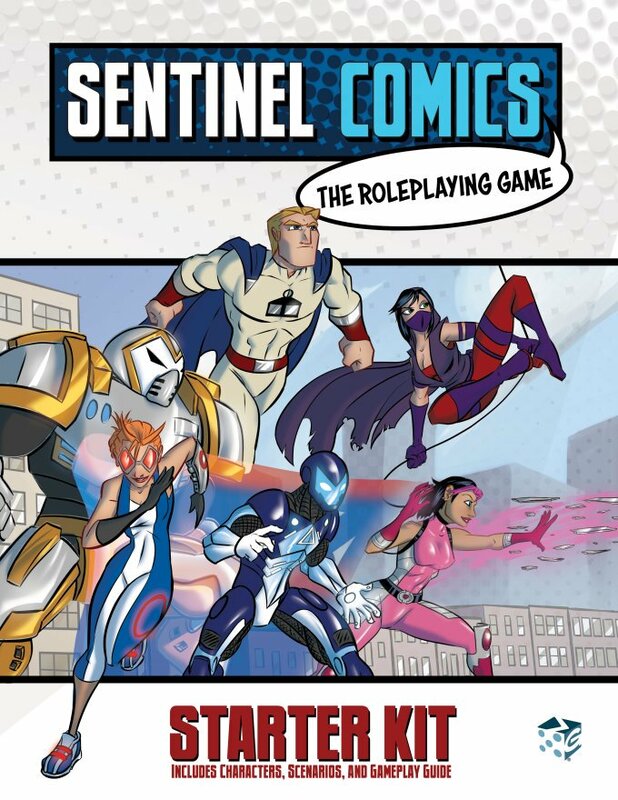 Sentinel Comics: The Roleplaying Game Starter Kit released in retail locations everywhere today, stop by your #FLGS to pick up your copy this weekend! @Shalvenay I have some gift vouchers that will expire with the new year, mom is making me feel guilty for having not spent them already, I need a new computer but I'm at the usual analisys paralisys step, which is further complicated by the availability of said vouchers. @Zachiel ah. I take it you're still on that box you don't know if it can run roll20 or not? @Zachiel probably worth a try and seeing how well/poorly roll20 runs? Also, I've been suggested a laptop that's for sale on Amazon, but I don't have a credit card so I need to have someone else buy it for me. A computer savy coworker tells me he'd never spend more than 300€ on a laptop (mine would cost around 1000€). Then I get told non-laptop PCs don't cost much less. I mean, I could ask hardware reccomendation but... "what do you want to use this laptop for?" "Oh, I have no idea. Something big enough to run whatever I will fancy using in the future, I guess." Isn't that a stupid approach? @Shalvenay Quite nicely, how 'bout you? Yeah, but who knows? Maybe next year some wonderful PC game I want to play will be too much for my cheap thing. Or the pdfs might load too slowly and scroll clunkily like on this PC. @ACuriousMind what's the line bwtween "using it for gaming" and wanting to play some games without the need for extra-crisp top-of-the-notch graphics? People keep telling me "you'll want at least an i5 if you don't do rendering". What if I wanted to install Poser again? I... I don't know. Somebody just tell me how much a reasonable budget is. I'll do what I can with that budget an maybe in 2 or 3 years I will have a laptop again. Well, "reasonable" is pretty difficult. I spent more than 1000€ on this PC a few years ago, but I'm a) an avid gamer and b) wanted something that would last a few years without becoming completely outclassed by newer stuff. It would have been just as "reasonable" to spend less and buy another one sooner, I guess. I spent around 1000 when I graduated for my now-dead laptop, and it lasted me 8 years and a half. Eight and a half years is a good service age for a laptop in active use. @ACuriousMind What if the only thing I do with my computer everyday is start it up after I get back from work, open Notepad, type |, save the document, and then shut it down?